INTERVIEW: prior panic "finicky things"
prior panic's debut lp "finicky things"
prior panic started as a solo project in mid 2016 by lead vocalist and cellist Julia Fulbright. Their debut album, “finicky things,” was released on March 30, 2018. The band consists of Fulbright, guitarist and background vocalist Otto Klammer, and drummer Zachary Ellsworth. Fulbright has played the cello for over ten years now and is classically trained. Fulbright played solo with their cello from October 2016-March 2017 before they put together a full band. The lineup has changed since the first show, along with former Boston band Dent. After taking some time off from Boston and music for mental health reasons, a consistent theme in prior panic’s debut album finicky things, Fulbright stayed with family in Texas over the summer of 2017. When September rolled around they booked a few full band shows and started writing/practicing with original drummer Francesca Impastato (she/her/hers) and current guitarist Otto Klammer (they/them/theirs). Klammer played bass in Dump Him and Dazey and the Scouts, who are some of Fulbright’s friends in Boston, but this is Klammer’s first time playing guitar in a project. prior panic’s lyrics read like intimate poetry, from “a twin size bed comes with its set of charms/let's smoke for two/through an entanglement of legs and arms/i can't see you,” from float to “i never knew the weight of seeing myself sink to rock bottom/i hold that weight like i'm cradling a newborn child” from still here. Fulbright’s wildly powerful voice is smooth as the instruments accents their hard-hitting words. One of the standout tracks on the album, farewell ADL’s, refers to the routine activities that people tend do every day without needing assistance such as eating, bathing and dressing. Fulbright belts out “my sugar rush, i'll ride your high throughout the night/i'm restless, searching for something to compromise...i'm naked standing in the storm/trying to prove i can create my own warmth.” This track holds the weight of Fulbright’s exploration into mental health, the center of the powerful storm of finicky things. This is where listeners find an oasis, a landing strip to breathe and feel connected to someone who understands. 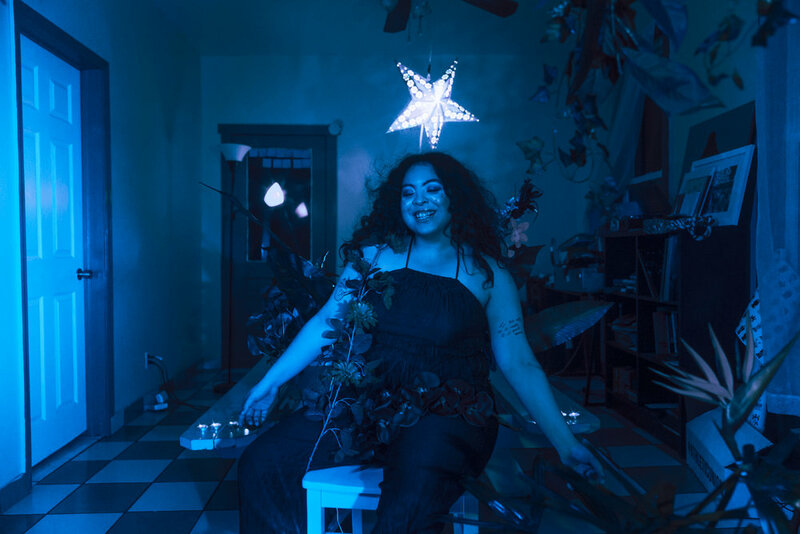 REVIEW: KAINA's Debut EP "4u"
Kaina Castillo is a 22 year old first-generation Latina rising in the Chicago music scene. After being mentored by Chicago natives like the O’My’s, the mega-magical singer’s multidisciplinary work around the city has finally brought her to a sound all her own. Castillo released her soft and soulful debut R&B EP, 4u, on March 16. The 3-track compilation, "cry," "happy", and "4u", produced by longtime friend Sen Morimoto takes you to a warm world dripping with Castillo’s honey vocals. This EP is a follow-up to her collaborating with the Burns Twins on sweet asl. Castillo was recently a direct opener for Kali Uchis at Concord Music Hall, Jamila Woods at House of Vans and played Mamby on the Beach in 2017. "happy" is Castillo’s first music video, and with visuals by Dennis Larance and design by Kevin Shark her flowery aesthetic is brought to life. She is bathed in a calming blue light as the camera zooms in on her glittery eyeshadow and wavy dark hair. Plant life surrounds the black-romper clad crooner as she holds flowers and vines, looking like Mother Earth herself. Castillo is here to bless us with a project that is perfect for these upcoming starry summer nights. The EP flows seamlessly as tinkering piano notes float below Castillo’s hauntingly beautiful voice, giving the listener the sensation of gliding through water. It is easy to know the words of Castillo’s lullabies, each sentence folding into the next. In cry Castillo sings “Sunny day won’t take your love for granted / Just stay this way there’s nothing better than you in the worth that makes the bad things get much better / Oh I hope and pray that things will never fade.” She ends the number with a rhythmic homage snapping as she encourages listeners ‘lean with it and rock with it’ with her.